Above: Linda Stirling in a pretty publicity portrait taken sometime during her career at Republic. None of the sound-era “serial queens” ever became quite as famous to the average moviegoer as the silent era’s Pearl White, whose name remains synonymous with the cliffhanger genre to this day, but the sound serial heroine that came closest to White’s fame was undoubtedly Linda Stirling. The willowy brunette was Republic Pictures’ third and most successful serial queen, picking up where Kay Aldridge left off. Unlike Aldridge, who was charming but no thespian, Stirling was a very capable actress as well as a striking beauty, delivering lines with assured and rather refined poise, but raising her acting to a realistically alarmed pitch in perilous situations. Stirling was the only Republic serial queen to star in more than three chapterplays, and this multiplicity of credits, along with her beauty and talent, made her the most famous of the sound chapterplays’ heroines. Linda Stirling was born Louise Schultz in Long Beach, California. An aspiring actress from an early age, she acted in community theater as a teenager and enrolled in a dramatic academy after her 1939 high school graduation. She paid her way through her two years of acting school by working as a photographer’s model, and was cast, along with other California models, as a background player in the 1943 United Artists film The Powers Girl, a drama set in the modeling world that starred George Murphy and Anne Shirley. This was her first experience before the camera, but it was her modeling work, not this brief bit, that brought her to the attention of Republic Pictures. The studio was seeking an actress to replace their soon-to-depart serial queen Kay Aldridge, and when one of their producers spotted Stirling on a magazine cover, they interviewed her for the job. The studio quickly decided to crown her as a new queen, and she was signed to a three-year contract and cast in her first serial, The Tiger Woman (Republic, 1944), which had originally been intended as a vehicle for Aldridge and Allan Lane, co-stars of the popular serial Daredevils of the West the preceding year. Republic had partly decided to hire Linda because of her athletic appearance, but she had never been on a horse before, which caused her some trouble when filming the action-packed Tiger Woman, which contained a fair share of horseback chase sequences. With the help of some on-the-job training from two of the serial’s supporting players, veteran Western actors Duncan Renaldo and George J. Lewis, she managed to survive, despite being frequently run away with (and sometimes thrown) by her horse. Tiger Woman’s title character, played of course by Stirling, was a jungle ruler in Latin America–and, unbeknowst to herself, the daughter of a millionaire who had died in a plane crash in the region. Allan Lane played oil company engineer Allen Saunders, who, after some initial misunderstandings between the oilmen and the natives were cleared up, joined forces with the Tiger Woman to thwart the villainous attempts of rival oilmen (LeRoy Mason and Crane Whitley) to halt his company’s drilling. The villains were also out to get their hands on the Tiger Woman’s inheritance before she learned she was the missing heiress Rita Arnold, but both schemes were wrecked by the leads’ opposition. Stirling was likable if not entirely convincing in her first serial, switching skillfully from a haughtily regal manner to sympathetic concern after being assured of Lane’s trustworthiness, but coming off as a little too sophisticated and self-assured in civilized surroundings for someone supposedly raised in the jungle. The chapterplay, however, was a great success, and ensured Stirling her place as the new serial queen. Above: Allan Lane and Linda Stirling in The Tiger Woman (Republic, 1944). Above: Linda Stirling as The Tiger Woman catches the bad guys raiding her tribe’s temple. George J. Lewis is closest to Linda, while high priest Robert Frazer is leaning against the altar on the far right. Republic immediately began to feature Stirling in their B-westerns, beginning with the Bill Elliott “Red Ryder” film The San Antonio Kid. She would co-star in about ten B-westerns and a pair of B-mysteries over the course of her Republic career, and play supporting roles in a few higher-budgeted movies like The Madonna’s Secret. The studio regarded her primarily as a serial performer, though, and would star her in five cliffhanger follow-ups to Tiger Woman. The first of these was Zorro’s Black Whip, an extremely fast-paced Western cliffhanger set in territorial Idaho. The villains of the piece (led by Francis MacDonald) were seeking to protect their lawless activities by blocking the territory’s bid for statehood. Frontier newspaper editor Randolph Meredith (Jay Kirby) opposed the outlaws both in print and as the masked avenger “The Black Whip,”(Zorro was never mentioned in the serial) but he was fatally wounded in the first chapter. However, his sister Barbara (Stirling) took over both the paper and the Black Whip guise, and finished her brother’s struggle with the help of government agent Vic Gordon (George J. Lewis). The nature of Stirling’s role forced her to spend a lot of her screen time under a face-concealing mask (which allowed her to be doubled by stuntwoman Babe DeFreest for riding scenes); however, her cheerful energy was very much in evidence in the scenes in which she interacted with hero Lewis or comic-relief printer Lucien Littlefield; she also conveyed properly grim determination when confronting the villains or making plans for their undoing, but did so without losing any of her feminine charm. Above: Linda Stirling discovers the body of her brother in Zorro’s Black Whip (Republic, 1944). Above: George J. Lewis helps a groggy Linda Stirling to her feet; villain Hal Taliaferro lies on the ground, near a saddle that Lewis used to prevent Stirling’s death-by-pitchfork in Zorro’s Black Whip. Linda’s third serial vehicle was Manhunt of Mystery Island (Republic, 1945). She was cast as Claire Forrest, the daughter of a scientist who enlisted criminologist Lance Reardon (Richard Bailey) to help her find her missing father on a small Pacific isle called “Mystery Island.” Claire and Lance soon found that Professor Forrest had been kidnapped by the sinister Captain Mephisto (Roy Barcroft), who planned to use one of Forrest’s inventions as part of a plan to control world industry. Mephisto, apparently the reincarnation of an old-time pirate, was actually one of the pirate’s descendants, who could change himself into a physical duplicate of Mephisto through a “molecular transformation” machine. The good guys attempted to discover which of the four owners of the island (all Mephisto descendants) was really the arch-criminal, while tracking down clues to Forrest’s whereabouts and thwarting Mephisto’s attempts to abduct Claire, who Mephisto wanted to use as a hostage to compel her father’s assistance. Manhunt of Mystery Island featured some terrific action sequences and a wonderful array of waterfront and ocean locales, and was one of Republic’s best mid-forties serials. Leading man Richard Bailey, a competent but astonishingly drab actor, was the cliffhanger’s biggest drawback, but Stirling’s presence on the good guys’ side helped to make up for Bailey’s deficiencies; her Claire was so likable and so winningly concerned about her father that she, rather than Bailey’s Lance, became the character the audience focused on. Above: Linda Stirling and Richard Bailey explore an old winery as Kenne Duncan (naval uniform) and Duke Green lurk beneath the stairs in Manhunt of Mystery Island (Republic, 1945). Above: Richard Bailey and Linda Stirling examine a fingerprint clue in Manhunt of Mystery Island. Manhunt of Mystery Island was followed almost immediately by The Purple Monster Strikes (Republic, 1945), which matched Stirling with Roy Barcroft again. Barcroft this time played the Purple Monster, a man from Mars sent to steal the rocket plans of Professor Cyrus Layton (James Craven), assemble a rocket prototype, and bring it to Mars as a blueprint for a Martian invasion fleet. As part of his mission, the Monster murdered Layton and assumed his body by using a weird gas; Layton’s niece Sheila (Linda) and hero Craig Foster (Dennis Moore) were unaware that the kindly professor was really the mysterious alien they were battling. Purple Monster Strikes was not the star vehicle for Stirling that her first three serials had been, but it still afforded her plenty of screen time. Her assured acting stood her in good stead in this outing, allowing her to gasp “The Purple Monster!” with proper horror and subduing any audience tendencies towards laughter at the unusual moniker. 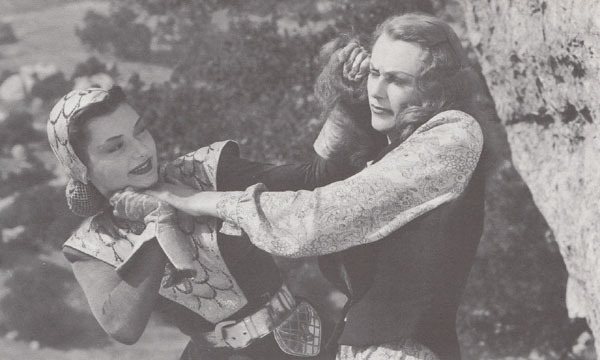 Above: Linda Stirling grapples with Martian agent Mary Moore in The Purple Monster Strikes (Republic, 1945). Above: Linda Stirling is confronted by heavies Bill Yrigoyen (center) and Clayton Moore in The Crimson Ghost (Republic, 1946). Above: Linda Stirling prepares to deal with what seems to be a prowler–but is actually Charles Quigley–in The Crimson Ghost. While filming Crimson Ghost, Stirling met Republic screenwriter Sloan Nibley, and they were married late in 1946. Linda finished out her Republic contract the following year, appearing in one more serial, Jesse James Rides Again. This involving 13-chapter cliffhanger starred Clayton Moore as a reformed Jesse James and pitted him against a gang of outlaws seeking to drive farmers from their oil-rich land. Though a good serial, Rides Again was not much of a vehicle for Stirling, whose screen time was limited. She played Ann Bolton, daughter of one of the harassed farmers, and served as the love interest for Moore’s sidekick John Compton. She was involved in a few memorable cliffhanger sequences, but spent most of her time at the ranch and didn’t show up at all in the last two chapters, which largely took place outdoors; (during filming, she was expecting her first son, and Republic decided to spare her any on-location trips). Above: Clayton Moore comes to the rescue of Linda Stirling, who has just escaped being squashed by a cotton press in Jesse James Rides Again (Republic, 1947). After concluding her Republic stint with a supporting role in the 1947 crime drama The Pretender, Linda retired from movie acting. She did perform in occasional West Coast stage plays, and, beginning in 1954, made a series of television guest appearances on shows like Public Defender, The Life and Legend of Wyatt Earp, and The Adventures of Kit Carson (the last of which was produced by her husband Sloan Nibley). Her final screen appearance was a small part as a member of a ladies’ club in a 1959 episode of The Real McCoys. Also in 1959, she began taking courses at UCLA, earning a Master’s and Bachelor’s degree in English Literature and ultimately landing the job of English and Drama teacher at Glendale City College in the 1960s, a job she held till her retirement in 1992. During and after her teaching career, she occasional reconnected with her acting days, receiving a “Golden Boot” award for her Western movie work, being interviewed in the documentaries The Republic Pictures Story and Cliffhangers, and appearing at the 1994 Knoxville Western film festival. In 1997, Linda Stirling Nibley passed away in Long Beach, California. Beautiful and intelligent, with a determined and serious demeanor tempered by appealing femininity and a fetching smile, Linda Stirling was the last great representative of a screen type–the serial queen–stretching back to the days of Pearl White’s silent outing Perils of Pauline. While the proverbial man in the street has almost certainly heard the phrase “the perils of Pauline,” he has probably never heard of the “perils of Linda.” Among serial fans, though, the situation is different, since the more remote perils of Pearl are not recalled nearly as thoroughly or fondly by serial buffs as the many adventures of Linda Stirling are. Above: A lovely Republic publicity portrait of Linda Stirling (center) is flanked by a few of her many screen perils. In the top left image, Stirling and Allan Lane dodge a cave-in in Tiger Woman. Then, Linda is tied to a chair in Zorro’s Black Whip (top right), trapped in an out-of-control airplane in Manhunt of Mystery Island (center left), and threatened by the Purple Monster (Roy Barcroft) in The Purple Monster Strikes (center right), the Ghost (bottom left) in The Crimson Ghost, and a western badman (Barcroft again) in Jesse James Rides Again (botton right). Acknowledgements: Joe Collura’s article/interview “Linda Stirling: Grace Under Pressure,” published in issue #21 of Cliffhanger magazine (1995), provided me with the biographical information in this article.